We start with a drama that you would have at least heard something about unless you've been living under a rock for the last month or so. Sky Atlantic's Fortitude has been heavily trailered throughout January to the extent that my anticipation was quite high going into it. The Fortitude of the title is an Arctic community in which there is supposedly no crime as everybody who lives there has a job. Therefore the town's sheriff Dan Anderson (Richard Dormer) has very little to occupy his time with apart from looking shiftily at any of Fortitude's tourists. 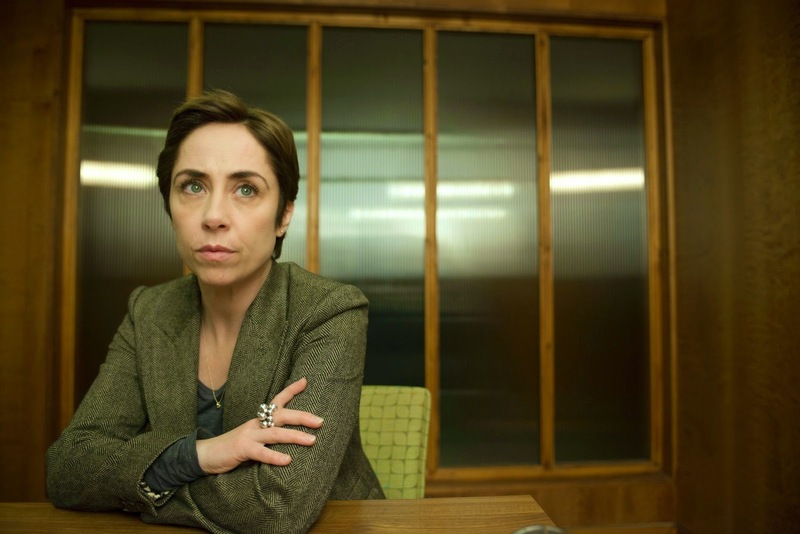 Meanwhile the majority of the town's interests are overseen by Governor Hildur Odergard (Sofie Gråbøl) who is also the chief of police and a trained lawyer. Hildur's big plan is to develop a hotel in Fortitude which will increase tourism and bring new employment to the area. However, the big sticking point is Charlie Stoddart (Christopher Eccleston); an Arctic biologist who heads up the area's research facility. After discovering the presence of an extinct mammoth in the area, Charlie informs the Governor that he won't give permission for her plans to go ahead. At the same time Charlie refuses to pay a man named Jason (Aaron McCusker) any money for the mammoth carcase that he's found. It was no surprise to me then when Charlie had been attacked in his home and left for dead. After dying in hospital, Charlie's death is ruled a murder and Dan is forced to work alongside quick-talking Metropolitan Police Detective Gene Morton (Stanley Tucci). Outside of the central case, there also seems to be a strain of polio potentially unleashed in Fortitude and let's not get started on the eccentric wildlife photographer who's dying of cancer. Based on the trailers, the cast and everything I'd seen about it, I really wanted to like Fortitude. However, I don't feel like everything that occurred in this 90-minute opener was necessary for me to enjoy future episodes. 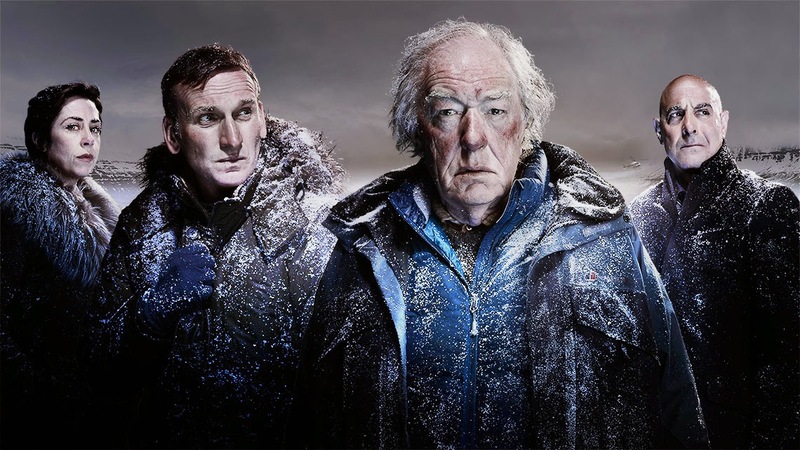 Although future episodes of Fortitude are slimmer, I struggled to concentrate throughout this feature-length opener as writer Simon Donald introduced character after character. I personally felt that, if the episode had ended with the discovery of Charlie's body, then the pace of this opening episode would've been a lot better. Another issue I had was that, at times, Fortitude resembled an episode of Murder She Wrote as Charlie went around making a number of enemies before his inevitable murder. However, if Charlie had been the victim in an episode of Murder She Wrote it wouldn't have taken Jessica Fletcher another ten episodes to crack the case. Instead we have Stanley Tucci's Gene Morton, who is the rank outsider in a community where everybody knows both your name and your life story. I feel one of the reasons the opener was so long was that the producers wanted to debut Tucci's character due to the fact that he's one of the headline stars. To be fair to Tucci, he was excellent at the straight-talking detective who we already mistrust due to the fact that he set off for Fortitude before Charlie was declared dead. Of the cast, Gråbøl made the biggest impact as the town's matter-of-fact Governor who sole interest was the fortunes of Fortitude rather than the people who lived there. I also thought that Dormer was well-cast as the dominant Sheriff Anderson; a slightly sinister figure who could believably enforce the laws of Fortitude. The Icelandic exterior shots were another highlight of Fortitude and gave everything a slightly mystical feeling. Whilst the cast and the locations are brilliant, I wasn't instantly sucked in to Donald's story and I felt the pace lagged significantly at times. With all of the stories now in place, Fortitude shows promise but I'm just not sure if I can stick with it for another ten episodes. Another star of Fortitude, Jessica Raine, has foregone her old stomping ground of Call the Midwife in order to participate in the Arctic epic. The fact that Raine's Jenny had now left BBC One's blockbuster drama made me worry for the fate of the show now that it had lost its lead character. Indeed, I felt that it may be time for the drama to call it a day now that both Raine and Miranda Hart had gone on to pastures new. However, I changed my mind partly due to the fact that it appears that the departures have allowed writer Heidi Thomas to tell some new stories. Over the first two episodes introductions were made to Nonnatus House's duo of new residents. First of the new arrivals was Barbara Gilbert (Charlotte Ritchie); a minister's daughter who had just finished her nursing training and had quite a bad reaction to her first alcoholic beverage. As with all of the drama's younger characters, Barbara has to prove herself in the eyes of the haughty Sister Evangelina (Pam Ferris) which she eventually does. 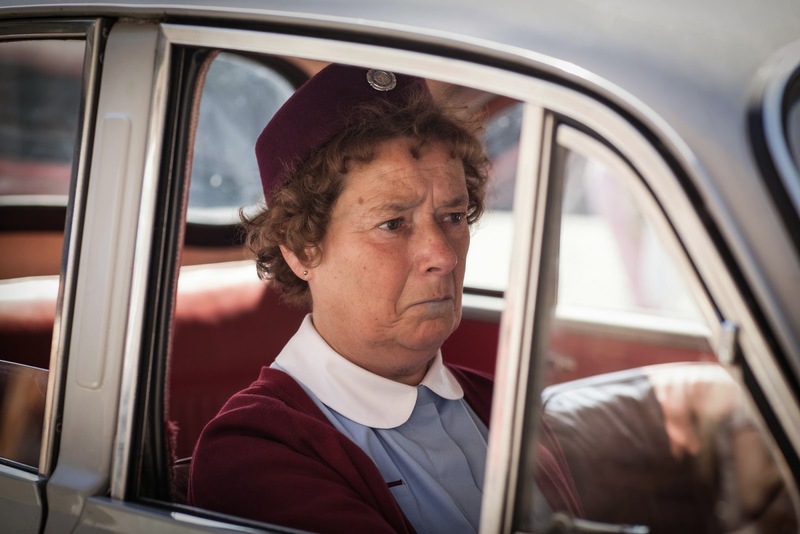 Episode two gave us another new nurse in Phyllis Crane (Linda Bassett); a larger-than-life creation who's new-fangled views on the way things should be done wound Evangelina up the wrong way. However, by the end of this week's third episode, Phyllis had cemented herself as an asset to the community after she rehoused a poor Irish family. The mass exodus in characters meant that Thomas had time to delve into the pasts of some of the more established nurses and nuns. For example we learnt that the motherly Sister Julienne (Jenny Aguetter) was almost tempted away from her faith by a smooth-talking beau. For those who've never seen an episode of Call the Midwife you'd be forgiven for thinking that it's a quaint Sunday night period drama. Indeed, there are certain storylines that would paint it that way especially whenever the drama focuses on bumbling handyman Fred (Cliff Parisi). However, Heidi Thomas' stories are a lot darker than you'd expect and at times I feel that pushes the boundaries of a pre-watershed drama. For example the first episode looked at a young boy who'd been forced to look after his sisters as their mother would abandon them for days at a time. Meanwhile, this week's instalment saw a seemingly normal member of the Poplar community being charged with gross indecency after an incident at a local men's toilet. The characters themselves are as complexly drawn from the dementia-suffering Sister Monica Joan (Judy Parfitt) to Nurse Patsy Mount (Emerald Fennell); who we recently learnt is a closeted-lesbian. I believe that the fact that Thomas is no longer basing the episodes on the memoirs of Jennifer Worth has allowed for more creative freedom. My one criticism would be that I'm not sure why the older version of Worth (Vanessa Redgrave) is narrating the story as she's basically remembering things she wasn't a part of. However, my feelings that Call the Midwife should come to an end were unfounded and I believe that the drama has now entered into its second chapter. 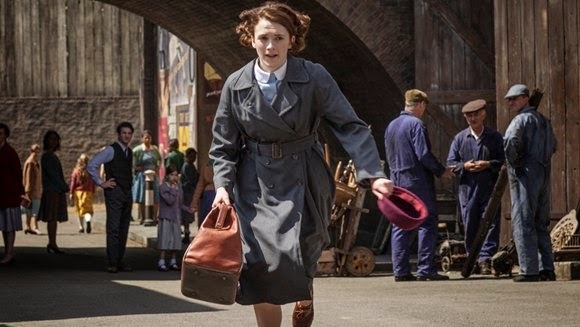 With ratings as high as ever and a fifth series already planned; it seems that Call the Midwife is with us for some time to come and if Thomas can keep the quality of the episodes up then I've got no problem with that at all. 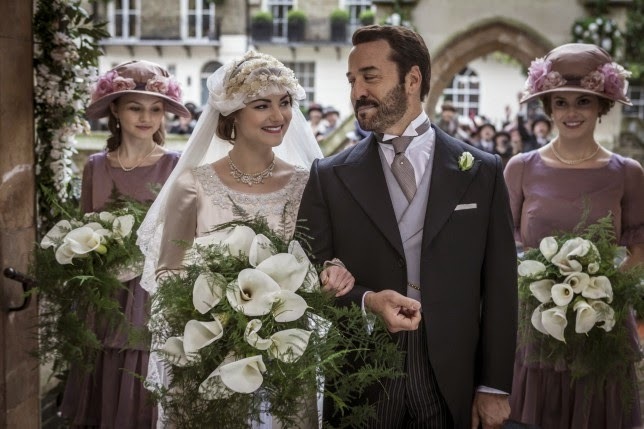 Unfortunately ITV's big Sunday night period drama Mr Selfridge doesn't appear to have the same momentum as its BBC rival. The action moved to 1919 where Harry (Jeremy Piven) was grieving the loss of his wife Rose and was distracting himself by buying loads of new stores. Meanwhile Harry's daughter Rosalie (Kara Tointon) married sleazy Russian aviator Serge (Leo Ockenden) who couldn't even wait till the end of their reception before hitting on other women. It appears that Serge's primary reason for the marriage is to convince Harry to buy up an airfield, however our hero soon has other plans for the land when he meets activist Nancy Webb (Kelly Adams). Elsewhere, the effects of the war are felt everywhere from the a returning Henri Leclair (Gregory Fitoussi) suffering from shell-shock and the male and female loading bay workers clashing. I was a big fan of the second series of Mr. Selfridge but I feel that the show is now a ghost of its former self. The loss of both Frances O'Connor and Katherine Kelly was a big blow to the show whilst a lot of the storylines are flimsy at best. The return of the sneering Lord Loxley (Aidan McArdle) is a retread of last year's plot and I'm sure Harry will get the better of his nemesis once again. I also believe that the cast should have been streamlined as I don't think that the likes of Samuel West's journalist and Trystan Gravelle's bar owner have anything to offer any more. Elsewhere, Kara and Hannah Tointon struggle to maintain their American accents and even the usually excellent Aisling Loftus and Amanda Abbington seemed a little off their game. It's a shame that Mr. Selfridge may end with a whimper rather than a bang but I do believe that, based on the evidence of this first episode alone, it may be time for this shop-based drama to close its doors for good. Even before Mr. Selfridge returned, ITV's Sunday night line-up was already in trouble thanks to the introduction of Get Your Act Together. This bizarre light entertainment programme saw c-list celebrities learn a myriad of variety skills and then compete against each other for the benefit of a studio audience. Every one of the fairly famous faces is coached by an already established act so for example former Westlife star Brian McFadden learnt escapist magic from Penn and Teller. Although the premise seems fairly pedestrian, what makes Get Your Act Together so bizarre is the way it's been filmed. Bland host Stephen Mulhern meets each act backstage and for some reason we're forced to follow their progression to the stage before they perform. The producers also keep up the pretence that we're eavesdropping on every element of the show as the other acts commentate on their rivals from the green room. Additionally, we hear from the audience after the end of each act as they attempt to decide who to vote for after all five have performed. Oddly, as well as normal folks in the audience, there are numerous celebrity attendees including Lionel Blair and Christine Hamilton. It's never quite explained why there are celebrities in the audience as well as on the stage, but it's one of Get Your Act Together's many elements that doesn't really make sense. Get Your Act Together does really seem to have the philosophy of throwing everything against the wall and seeing if any of it sticks. To is credit it did have a couple of memorable moments but these were mainly when the celebrities couldn't master a skill such as Sherrie Hewson's plate-spinning or Nigel Havers' ventriloquism. But two minute highlights from a forty-five minute show does not a decent programme make and overall Get Your Act Together ranges from the dull to the extremely puzzling. Mulhern said in a recent interview that he was shocked about the reception that Get Your Act Together has received, but I'm not quite sure why as nothing about the show screams hit and I'd be very surprised if was recommissioned following this first disastrous run. As I wanted to finish on a high I'll quickly touch on a programme that I've been enjoying immensely, that being Channel 4's latest sitcom Catastrophe. The show is written by and stars Sharon Horgan and Rob Delaney as, oddly, Sharon and Rob a transatlantic couple who are forced together after their six-night stand resolves in her getting pregnant. Anyone who watched Horgan's awesome BBC Three sitcom Pulling will enjoy what ensues here as Catastrophe is written in a very similar vain. Although there is the odd bit of crass humour thrown in, what really makes Catastrophe works is the sweet-natured relationship between Rob and Sharon. These are two decent people who are thrown together but try to make the most of their odd situation and grow to like each other as the week's progress. Catastrophe benefits from a mixture of well-constructed set pieces and character-based gags which result in an extremely pleasing half hour. Highlights so far have included Rob's attempts to propose to Sharon; including his purchase of a ring and his loss of the item of jewellery just before the proposal itself. Horgan and Delaney also write in some rather tender moments between their characters as Rob is forced to reassure Sharon after she discovers she has pre-cancer. As they've written the parts for themselves, both Horgan and Delaney are an absolute joy to watch in each beautifully constructed episode. The writers have surrounded Rob and Sharon with a glut of larger-than-life supporting characters including Ashley Jensen's insufferable homoeopath and Mark Bonnar as her slightly menacing husband. Star Wars legend Carrie Fisher is also part of the ensemble as Rob's overbearing mother who attempts to coax him back to the States and abandon his foreign baby. Three episodes in and I'm already in love with Catastrophe thanks to its brilliant characterisation and realistic situations. I'm so glad that Channel 4 have committed to the comedy, already commissioning a second series, as Catastrophe is one of their most well-rounded sitcoms in recent years.